Backed by rich industry experience and knowledge, we are offering premium quality range of PTFE Insulated RTD & Compensating Cables. These cables are fabricated using the finest grade material and sophisticated technology in adherence to market prevalent norms. Can be used in various industries for different purposes, these cables are widely praised among our client for their optimum performance, heat resistance and durability. 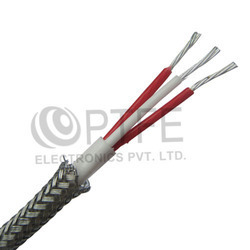 In additions, our offered cables can be availed as per the client’s various demands at pocket friendly prices. We are offering RTD And Compensating Cable to our clients.